This networked mangling and AI mimicry triggered an itch – an itch to continue pursuing online connection, digital expression and networked collaboration. This itch stayed constant despite being partially scratched by the Meztexts generated during TxtTales and Assorted Beasties. So on joining a mailing list called ‘7-11’ in 1997 [found through some such rabbithole or recommendation] my creative considerations sloped again. I was thrown head[and torso]long into an arena filled with likewise gestating ‘net.artists’/writers. The likes of JODI, m@, =cw4t7abs/Integer, Heath Bunting, Alexei Shulgin, Vuk Cosic, Olia Lialina, Keiko Suzuki, Mouchette, Luther Blisset, Murph the Surf, ‘Jeff Koons’ and countless others proceeded to collaboratively roll and batter networked output. This 7-11 jaunt soon lead to the regular use of mIRC [which I still use on a daily basis] as well as joining a host of other list forums including Nettime, Fleshfactor, RHIZOME_RAW, (Xchange), FACES, Syndicate, [American_Express], ScreenArts, Audiovision, newmedia, , INFOWAR, trAce, and Thingist. Here, participants bantered and code-mashed. We engaged and theory-flung. We creatively trolled. We word hacked and pranked: anonymously, harmlessly. We ASCII-bombed and protocol-strangled. We meta-trawled and spammed – fiercely, constantly. We bashed output until it no longer resembled software and/or discourse. And out of this chimeric soup arose Mezangelle: a fomenting language born-torn from the writhing[s] of this original ‘net.art’ crew. From this squirming birth, Mezangelle proceeded [and continues] to evolve. Originally, it patched stylistics drawn from these forum bloodbaths and code [s]mashings. Nowadays, it alters networked output to explode and enhance meaning beyond the expected, similar to making ‘plain’ text blossom through a hypertextual lens. Mezangelle beg-beckons readers/users/players to unzip, to be curious, to unlock. To meaning piece. To question and collapse. When Mezangelle started gaining critical traction in the late 1990’s, my codification alarms tripped. 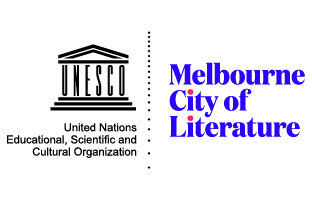 In 2000, after being commissioned to create a centrepiece mezangelle work for the trAce Online Writing Community [and determined not to become a self-repeating, signature-work-reliant parody] I began form[at] flipping Mezangelle. New media works that made interactivity their main focus started percolating, with heavy use of online-generated texts fleshing out their core. 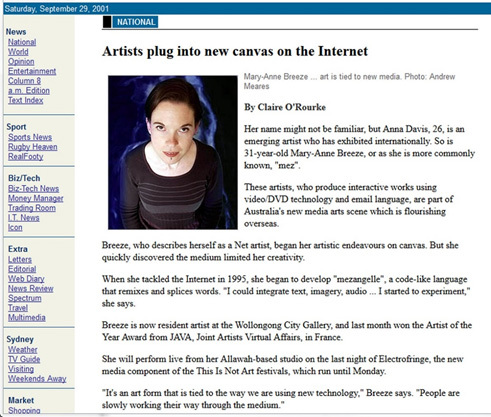 In 2001, I merit-bludgeoned my way into the first Australian Digital Writing/New Media Residency hosted by Wollongong City Gallery. The year long residency allowed me to craft such creations as The Data][h! ][bleeding Texts [TDBT] and _][ad][Dressed in a Skin Code_ [aDSK]. At this time, Mezangelle continued to manifest in game-related spaces, making sneaky appearances in Massively Multiplayer Online games [MMOs] such as Everquest and World of Warcraft. If you desired your in-game chat hijacked, remashed and otherwise poetically altered, then I was your gal. I’d also mangle logs of these chats and project them into a wider networked sphere via forums and social networks. In 2005, when feeling buzzword-strangled by a growing industry push for networked writing to be ‘immersive’, ‘engaging’, and ‘cross-platform’ [*blergh*], up jumped The W[n]e[t]b.Wurks_Series. The series contained two works, ID_Xor-cism and Types.of.Und.Fineable.Ware[z]. 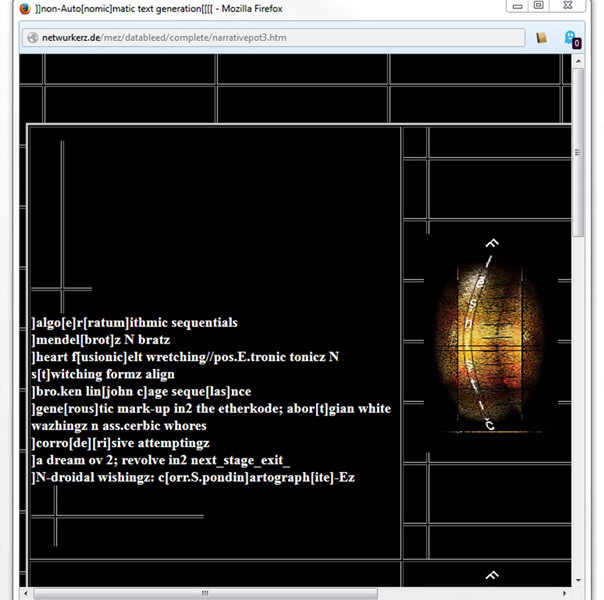 Both works are sidescrollers which pair minimalist text [with origins in networked back-n-forthing] with non-interactive ‘eye-candied’ graphics. Interaction in ID_Xor-cism is mainly in the interpretation, but a singular explanation does not avail itself. Is the ‘ID’ being exorcised or exercised? Is ID identification, or the psychoanalytic term for the source of impulse to pleasure principle (or both)? Different readers will have unlike perspectives, and some will see it both ways. Viewers of Mez’s works are not only required to read (and sometimes interact), but to translate the mezangelle language, which often (if not usually) creates multiple interpretive possibilities. Mez’s interest in playing with – and making as much as she possibly can out of – ASCII code is obvious; the addition of images gives viewers more to work through … Mez works this possibility – with her use of language, and by using images as prefix and suffix – to extreme ends, and by doing so metaphorically hits two, three, or more notes at with a single gathering of letters formed into a word in ways previous generations of writers could not. – C T Funkhouser. New Directions in Digital Poetry. NY, NY: Continuum, 2012. In 2007, Meztexts scrabble-slanted yet again. On discovering the pithy [and hashtag] potential of Twitter [and similar social media], microfictions spewed forth. As a result, I was invited to transpose such ‘microwurks’ into a white-cubed gallery setting. 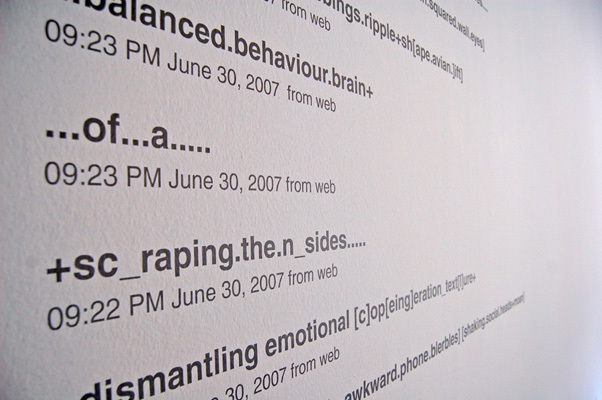 And so an extract from my 2007 Twitter stream [entitled _s[p]erver[se]_: 404 poetry_] made its printed-directly-onto-a-gallery-wall-way into the 2008 show ‘YOU OWN ME NOW UNTIL YOU FORGET ABOUT ME’, held at the Museum of Modern Art Ljubljana. 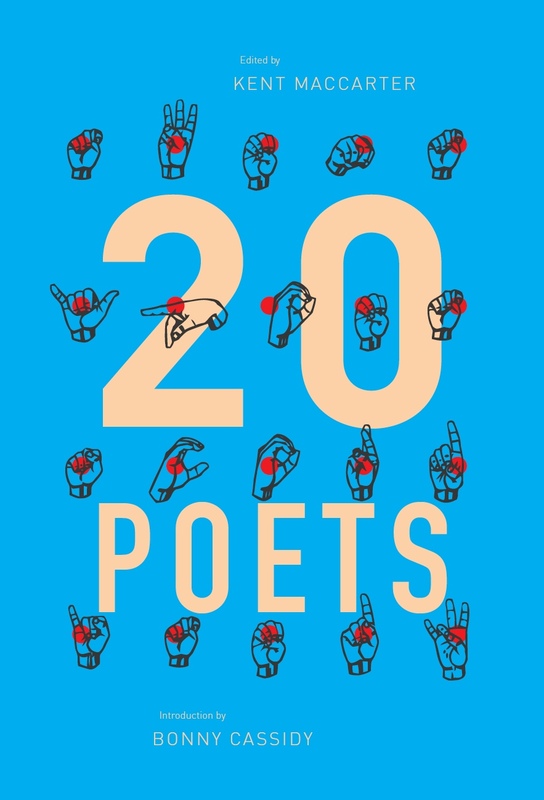 I suspect _s[p]erver[se]_: 404 poetry_ *might* just be the first instance of a Twitter feed exhibited in such a Mixed Reality format. This Twitter tinkering soon led to another Digital Writing Residency, with a 2008 New Media Scotland’s ‘Twitter Resident’ commission resulting in a month-long tweeting stint. The residency prompted the Twitterwurking Meztext [an entire mezangelled narrative tweeted out through the @mediascot feed]. The quirk, however, didn’t end there: part of the Residency involved the production of a line of ‘t[weet]shirts’ – a product line including t-shirts offered for sale through the New Media Scotland Spreadshirt store. These products were custom-printed with phrases drawn from the residency tweets [such as ‘plot-fodder’ ‘sign[ull]al.lost’]. I’d select a daily ‘tweetbyte’ and Mark Daniels, the organisation’s Executive Director, would coordinate presenting the product for sale online. Never content to story-create in any boring fashion, during the Twitter Residency I created a tandem-type of Twitterwurking meta-commentary via my own @netwurker account. This tweetset initially offered daily comments on the characters and plot developments that were occurring in the primary residency stream. During the course of the month, however, the meta-tweets began to mutate into more than just a simple commentary: they gelled into their own poetic narrative. Typical.